The fastest and most secure method. With a direct debit, an online payment goes quite simply. You are also on the safe side with the use of a secure e-banking payment. A expedient transaction confirmation also allows your order to be processed quicker than normal. Thus, with a direct debit you can look forward to you a faster delivery! You can also utilize a safe and easy payment via PayPal. At the end of the order process you will be routed directly to PayPal. If you are already a PayPal customer, you simply login with your username and password, and the payment is confirmed. If you are not already a PayPal customer, you can setup payment with a one-time guest access or you can open a PayPal account and then confirm a payment. As soon as the order is processed, the payment amount will be withdrawn from the purchaser’s account and when the order is sent, the user’s payment is processed. In the case of a return, the credit value will be returned to your PayPal account. You can also pay safely and easily at Dynafit with a credit card. We accept Mastercard and Visa. Your account will be charged when you complete your order in our shop. If the product is returned to us, the charge will be credited to the same credit card account. The SSL protocol we use encrypts your credit card information for security. The respective bank may also request a PIN or password during the payment process from the seller. 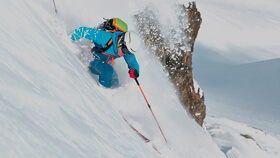 This high security standard ensures a purchase from Dynafit with a credit card is very safe. Dynafit arranges delivery of products ordered to the purchaser. All products can be delivered directly, are processed in our warehouse in Bolzano, Italy, and sent via UPS. Delivery will be completed within 1-3 days after receipt of an order. This delivery window begins once the package is transferred to the courier service. After UPS receives a package, you will receive a tracking link by email with which you can follow the status of your package. If you have not supplied a different shipping address, the delivery will be sent to your billing address. Shipping fees for your order will be shown prior to finalizing your order and will be charged together with the value of your products. All products purchased in the Dynafit Online Shop may be returned within 30 days as long as the products are unused, undamaged and complete. This window for returns begins the day a package is delivered. In order to complete any return expediently, please fill out the return paperwork and put it in the box with the products being returned.